This week was all about our 15th KronosWorks annual customer conference. This is the crescendo of our annual marketing plan at Kronos, bringing together over 2100 attendees from around the world. We spend the 5 days of KronosWorks sessions celebrating customer success stories, bonding with those customers over drinks and dinner, and reminding ourselves of how far Kronos has come as a company in 35 years. It’s not the same as being there, but you can watch a bit of the general session here, including remarks from our terrific CEO Aron Ain. The photo to the left is of a portion of a mural that an artist created real time during his speech – an infogram on the fly if you will. As in many businesses, our days can sometimes be spent focusing on making things better for customers – especially those who need our help because something’s not going right. Having so many happy customers at an event like KronosWorks reminds me that we do an awful lot of things right – and have for years. The stories customers shared about the transformational results they’ve achieved with Kronos were awesome. We had several guests from the analyst and blogger community in Las Vegas this week who were learning about Kronos for the first time. One said to me, “I had no idea how cool you guys were!”. This was in response not only to our announcement of Workforce Tablet, but also the friendliness and openness of the Kronos employees and executives they were meeting. The use of social media by KronosWorks attendees increased sharply this year, especially on Twitter. 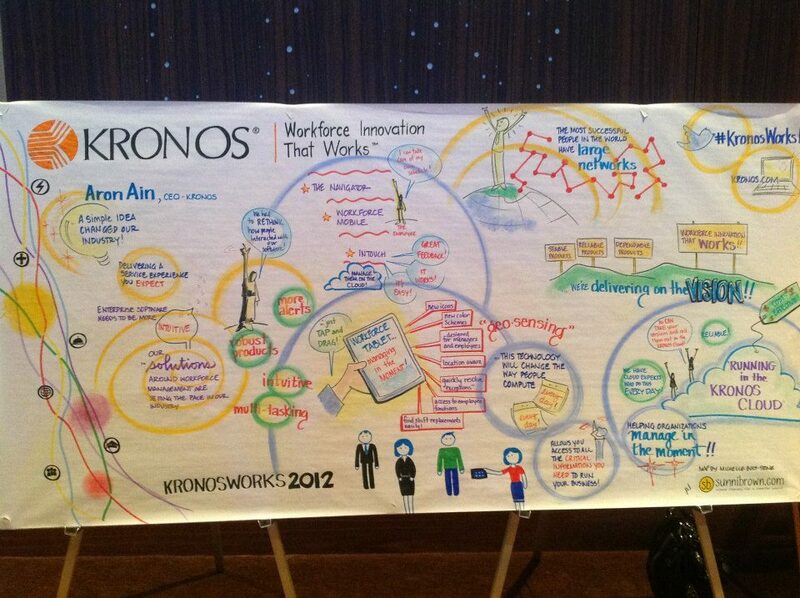 You tweeters can check out #kronosworks12 to find hundreds of comments made during the event. One really intriguing session I attended was conducted by SHRM’s Curtis Midkiff via Google+ Hangouts. You can watch the entire session here to get a flavor for this very cool (and virtually free) means of sharing “live” experts virtually. Blogging4Jobs – Can Your Business Leverage Big Data & Manage in the Moment? How Much Social Media is Too Much in the Workplace? Hey boss, I was a “blogger attendee,” and I had something to say, too! I’m going to take the weekend to cope with the oversight. So sorry! But you know I auto-retweet everything you post! Ronda – I am using WordPress as the platform, and the Linen Pro Child theme. I’m glad you like the blog. Good luck with yours!